Philips HeartStart FR3 AED | NEW! 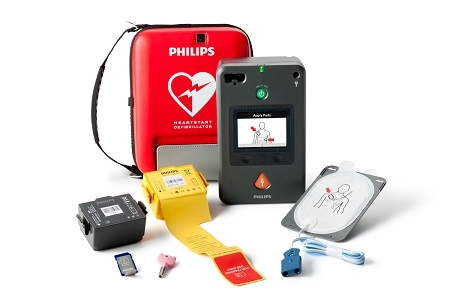 The Philips FR3 AED has the entire AED industry abuzz and with good reason. 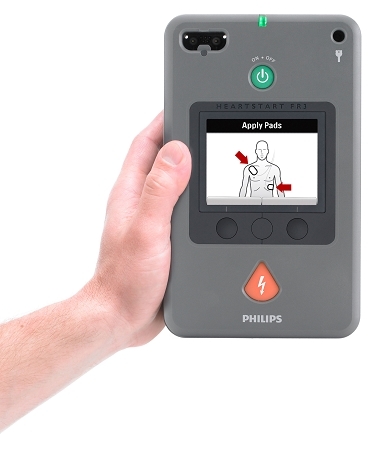 Combining the finest technology with ease and simplicity, the Philips HeartStart FR3 is an AED that is sure to become a favorite both with trained professionals and lay responders alike. The Philips HeartStart FR3 is the toughest AED within the Philips lineup and is the smallest and lightest available today. Weighing a meager 3.5 pounds, the Philips FR3 is still incredibly rugged and is capable of withstanding the most extreme conditions. With an IP55 rating, the Philips HeartStart FR3 can withstand jetting water and dust. 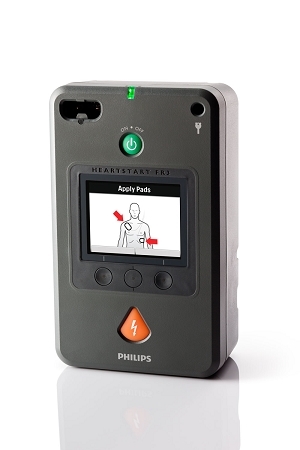 The Philips FR3 AED walks responders through the AED administering process, enabling untrained lay responders to respond in a time of need while also providing trained individuals with friendly reminders during a stressful situation. The Philips FR3 also features a metronome, which easily keeps one in sync when providing CPR. The Philips HeartStart FR3 also features a bright color LCD for textual instructions, and an optional ECG display model is also available. The Philips FR3 turns on automatically once the carry case is opened, saving time for deployment. The Philips FR3 AED also includes pre-connected SMART Pads III, yet another step that saves time. The Philips SMART Pads III are also good for both adult and pediatric patients (pediatric patients will need the Infant/Child Key). The Philips FR3 AED also executes self checks on a daily, weekly, and monthly basis. Should anything require maintenance of any sort, the Philips FR3 will display a message on its graphical display, in addition to audible alerts. The Philips HeartStart FR3 can also be configured to be bilingual. The long-life battery of the Philips HeartStart FR3 delivers an incredibly impressive 300 shocks and is also good for 12 hours of patient monitoring. The Philips FR3 is without a doubt impressive and is an AED that any program would stand to benefit from. 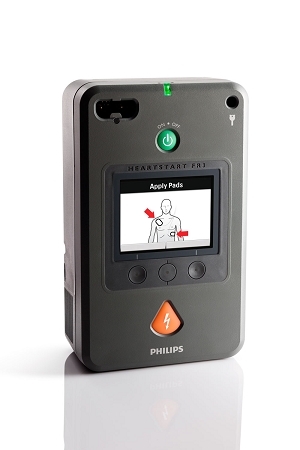 In addition to its rugged design and innovative features that increase the speediness of one's response, the Philips HeartStart FR3 includes a five-year warranty and hails from the most trusted brand within the AED industry.